How many times have you tried to get on with a project only to be stopped by your children demanding attention!? There is a solution, get them to join you. In this article, I’ll go through the basics of how to teach children to quilt. You can start them at quite an early age, my own Granddaughter (Eve) was just 5 yrs old when I introduced her to sewing and 8 when I started teaching her how to quilt. She’s 14 now and at the moment is mainly interested in Ed Sheeran and filling in her eyebrows, quilting is low on her priority list! Young children will want to do what the grown-ups are doing and it’s best to get them involved right at the start of a project. They also like to do things with their friends so get them to invite a friend round to join in. Firstly, if you haven’t already done so you need to teach them to use a sewing machine. 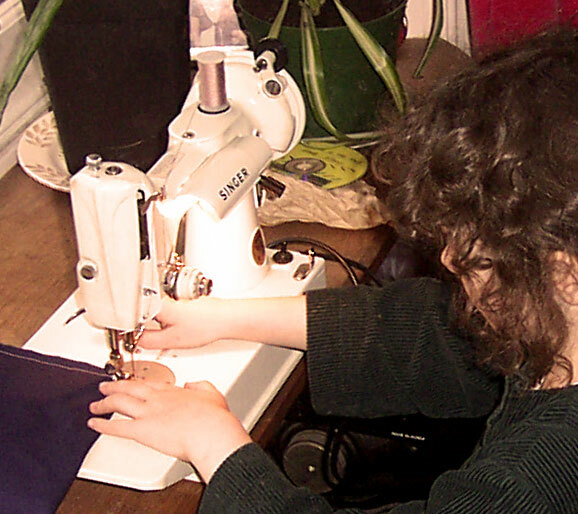 I was lucky enough to have a Singer Featherweight for Eve to practice on, it was a perfect size for her small hands. Put a bit of tape on the 1/4″ mark, it’s much easier for a child to follow this guide rather than the etched in one on the plate. The most important thing is to show them how to guide the fabric through while keeping fingers away from the needle. Kids are pretty smart and pick it up quickly! If you want to buy them their own sewing machine for quilting, check that is has a slow speed setting, great for children. You also want to make sure it’s easy to set up and use, your child will soon lose interest if you’re spending ages trying to get the machine set up! Next, show them colorful fabrics, let them choose. 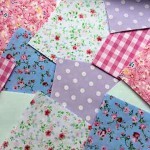 You probably have a large fabric stash so let them have a rummage. You might not like their choices and they might not choose matching fabrics but just go with it, it’s their project! The first project should be something very simple but will also be useful. Eve’s first project was a small bag, it’s a shame that at the time I never thought to take pictures. 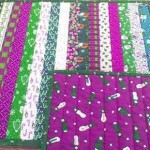 It was made with a basic patchwork from small squares and some fusible batting to make it easier for her to put together. We didn’t use a specific pattern for this project but made it up as we went along. Most kids like to give presents so they might like to make a gift for Grandma like a placemat, or even smaller, a coaster. Squares and rectangles are easy to cut out so stick with these simple shapes to start with. You can use a small square quilting ruler to mark the squares or you might have a small square object for your child to draw round. A few rectangles or squares pieced together is simple but effective, we know kids have a short attention span! I wouldn’t recommend a rotary cutter for children, but they can usually manage to use scissors. The best way is for you both to cut the squares using scissors. You’ll probably cut most of them, but as long as she/he feels they are doing the work with you that’s what matters. One way to minimize the cutting is to use jelly roll strips. Just cut some strips into 4 equal sizes and piece together down the long side. You can use this method for placemats, coaster and bags. If the project is a bag, then sew 2 strips right sides together down 3 sides. Turn right sides to the outside to get a reinforced strap. Finally, if you know how to teach children to quilt AND they have fun, they will always remember it and want to return to the sewing machine for more! If you’re thinking of purchasing a new sewing machine for quilting then have a look on my review page for the best deals. You have a very lovely site here. 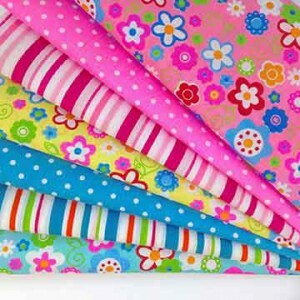 Quilting is a great activity to do with kids. It takes team work, and quality time with them. Something that children don’t get much of now days. Thanks for sharing! Thank you Alma. 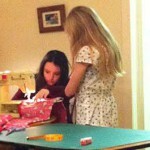 I love doing sewing and quilting activities with children, they are so focused! My Grandaughter isn’t doing much now, as I said in the article but I have another Grandaughter of 8mths. As soon as she is old enough I’ll have her on the sewing machine! I like the article. The site is very fun to look at and the idea is great. My ex’/ daighter’s father’s late grandmother croqueted and I wanted to teach my daughter this. I myself have no grasp of doing that, but I’m sure quilting would be a fun thing to do as well! Hi Laura, I’m pretty sure there’ll be an app for quilting soon, there seems to be one for everything else! I’ll bet if your sewing machine is serviced it will perform just as well as some of the modern machines. My favorite sewing machine is a Bernina from the 1960’s! I agree teaching a child to quilt at a young age is a great way to ignite that creative spirit and who doesn’t like a warm quilt folded up ready to use in the cold months? I also really like the design and look of your site, it is soo clean. I will definitely return here as a resource. such great advice for a project with kids! You are right, most kids just want to do what the adults are doing. If they feel included and involved, they will be on cloud 9 🙂 Great tips for easy quilting projects appropriate for their fine motor skills. So great that you were able to share that experience with your grand-daughter!